Morphy Richards is one of the leading brands in manufacturing electric kettles.The Voyager 200 electric kettle is a 500 ml electric kettle and has a power consumption of 1000 W.This model comes with a concealed heating element to enable easy cleaning. 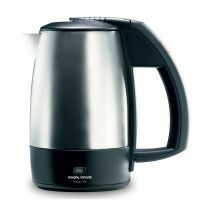 To Recieve updates and possible rewards for Morphy Richards Travel Jug(PP) - Voyager 200 please sign in. To Recieve updates and possible rewards for Electric Kettle please sign in.